Please note that the content of this book primarily consists of articles available from Wikipedia or other free sources online. 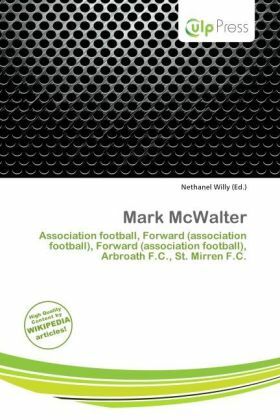 Mark McWalter (born 20 June 1968 in Arbroath) is a Scottish former football striker. McWalter began his career with his local club Arbroath where as a teenager he became a first team regular. His form attracted the attentions of top-flight St. Mirren, who signed him in June 1987. In and out of the team at Love Street, he joined Partick Thistle in June 1991 in a swap deal that saw he and George Shaw exchanged for Chic Charnley and David Elliot. McWalter's spell at Partick was an unhappy one however as he failed to score.